You pick out a ripe, golden piece of fruit and bite into the fuzzy skin which exposes sweet, tender flesh; juice runs down your arm, but you don't care because you are enjoying, what else, a perfect peach. The scene described is all about summer and some of its warm weather bounty. I especially remember peaches from my childhood because, at my mother's insistence, my dad bought a fruit tree for our yard. My mother said it was a peach-pear tree...I had never heard of that kind of tree before or since and I now know it was a white-peach tree sold under a false name to entice the novice backyard-orchardist. After two or three years, that mis-named fruit tree finally produced a few large and wonderful peaches. The flesh was white while the skin looked like a normal peach; the flavor was amazing and we were thrilled. The next summer, the tree produced a bumper crop! The peaches were smaller than the year before, but just as wonderful tasting. We could only eat so many peaches, however, no matter how great they were. 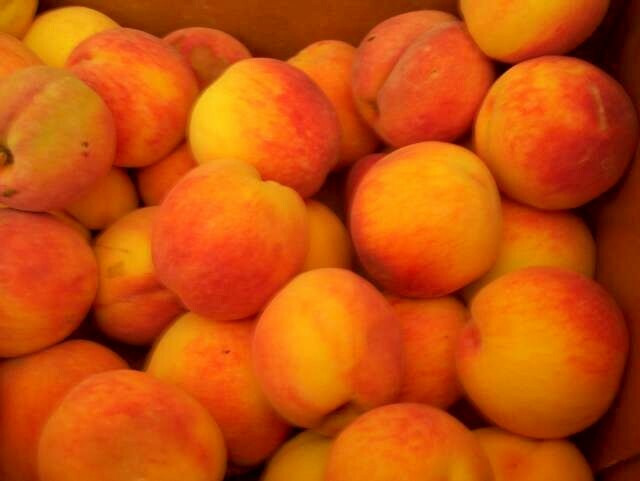 Mother had me load up bags of them in our wagon and made me to walk around the neighborhood to see if anyone wanted those peaches. Unfortunately, people seemed put off by the name, peach-pear and I had a hard time even giving them away; many peaches were, sadly, left to rot. My dad cut that tree down in the fall. He said Mother wanted to plant something else in its place. While I would love to have a tree like the short-lived peach tree from my childhood, I do get to enjoy the golden fruit brought up by friends from the bootheel section of Missouri. They are sweet and luscious. I have canned and frozen bushels of summer peaches. Canning them is a messy, labor intensive job, but the result is worth the time and effort. Home-canned peaches taste much better than commercial-grade. If you have a good vacuum sealer like a Food Saver brand, freezing peaches can be a time and labor saver; the frozen fruit will taste fresh even a year later. 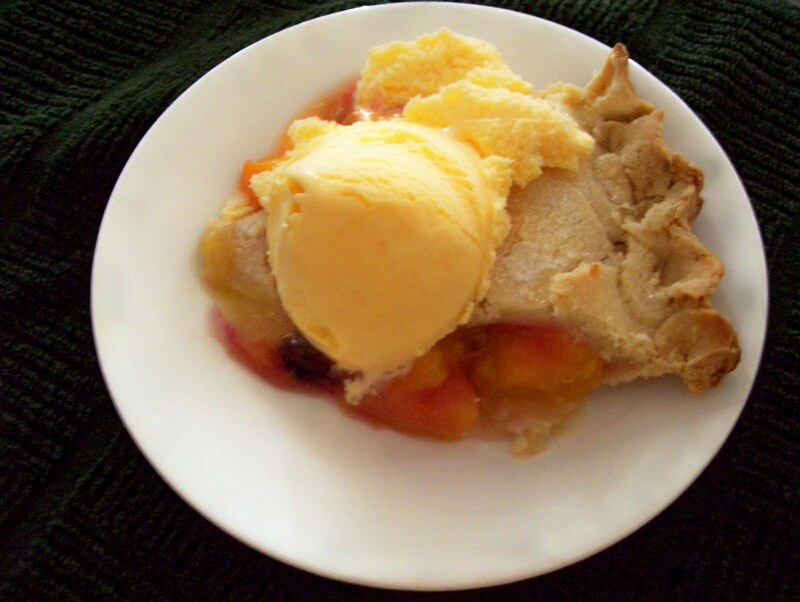 Peach season would not be complete without at least one fresh peach pie. The pie in today's recipe was made with last year's vacuum-sealed, frozen peaches. I also added a few fresh blueberries because I had them on hand. The pie was amazing. I served it ala mode and everyone thought it was the best peach pie they had ever tasted...maybe they were just humoring me, but I, too, thought the pie was wonderful. Place peaches in a colander and dip into boiling water for 1 minute. This will loosen the skins. When the peaches are cool enough to handle, remove the skins, slice the peach flesh about 1/2 inch thick and toss gently with lemon juice. In a pot, mix sugar, water and diluted cornstarch. Cook on med. heat until the mixture becomes thick and clear. (Stir constantly). Cook for several minutes after it comes to a boiling point. Add salt and mix well. Pour hot glaze over sliced peaches; mix gently and allow to become cold. 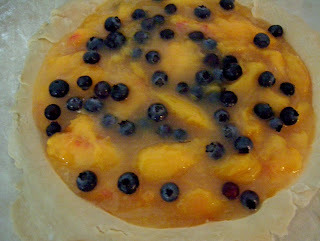 Pour the peach mixture into an *unbaked pie crust that has been sprinkled with bread crumbs. (I did not defrost the frozen peaches...I just put them in a bowl and poured the hot glaze over them and stirred until the peaches separated). *Post #16 contains the recipe for perfect pie crust and pie crust secrets. (2-crust pie directions: Place pie in a 400 degree oven for 25 minutes; at this point place crust shield or foil strips over crust edges to prevent over-browning. Continue to bake 15-20 more minutes. Remove pie from oven and remove crust shield; carefully place pie on a rack to cool).